The other day, she was here for her 60th Staples reunion. The classes of 1951 and ’52 got together for what Bev says were “4 days of partying.” Harry Truman may have been president when they graduated, but they know how to rock the house. Bev sent along some thoughts. They’re not about the reunion — no one really cares about those stories, unless you were the one reuning. Instead, they’re about her beloved Westport. 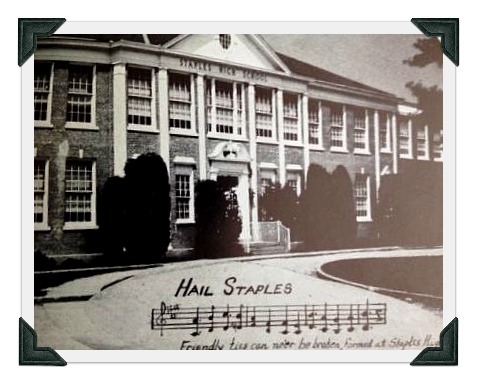 The Staples High School that the classes of 1951 and ’52 remember. But wait! Don’t hit the “Comment” button quite yet. 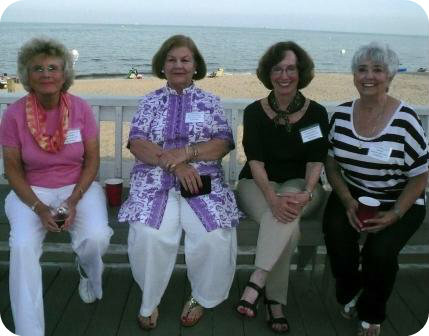 Bev Breault (far right) enjoys the beach — and all of Westport — along with (from left) Judy Morlen Mott, Jessie Thompson Huberty and Dale Brock Wortley. In fact — I know I said wouldn’t report on the event, but these almost-80-somethings deserve some props — though they’d planned on this as their final reunion, everyone said “no way.” They’re already planning the next one. “Are we still alive?” Bev asks. This entry was posted in Local business, Looking back, People, Staples HS and tagged " "Stepford Wives", Bev Breault, Staples High School Class of 1951, Staples High School Class of 1952. Bookmark the permalink. class of 1972 was pretty awesome too! Missing westport! Wow, I’m impressed . . . four days of partying on their 60th. I’m flying up for my 65th in three weeks, and one afternoon of catching up is about our limit.But those that can, should. I’m in Sarasota, FL ( actually University Park ). Where are you? WILKINSON WOODS between Bee Ridge & Proctor. Joan Simons Constantikes told me to look you up. I was in your back yard, almost literally, this morning. My M.D. is on Bee Ridge. I’m sure you know that Joan now has another last name to add. What a beautiful and inspiring group of women! thank you TweetieJo. Six of us travel somewhere together once a year even though we each live in different states!